Ligia was born in Quetzaltenango, Guatemala and has lived in the United States since 1994. She has painted her entire life. She holds a degree in graphic design and has mastered a variety of art forms, including oil, watercolor, acrylic and collage. Her watercolors have won recognition and formal awards in multiple exhibits. She lives in Corpus Christi with her physician husband and four children. “For as long as I can remember, I’ve had the ability to transfer my inspirations into graphic form. I was lucky; an appreciation of light, color, shadow and perspective came naturally to me. Those were the years of my life before migraine. Then, as a teenager, I began noticing distortions in the shapes, colors and lights of my oil paintings in the moments preceding a headache attack. The sensitivity to light during a migraine would force me to squint and then lose the details of my work. I would often continue working during an attack of migraine, and the end result would sometimes unintentionally tend towards the abstract. In my twenties, after my first pregnancy, my migraines took a turn for the worse. I began experiencing more disabling sympL toms during my aura; the visual distortion and photophobia were joined by nausea, numbness and weakness of my limbs and difficulty articulating words. I became very sensitive to the chemical scents of my oil paints, and the nausea and smell sensitivity that odor caused me led me to seek out scentless media like watercolor, ink and pencil. I also noticed that my sense of the intensity of colors changed during periods of migraine. Colors became bolder and more vibrant. Little would I know initially that those same colors would come to dominate my acrylics and watercolors as I passed from my thirties to my forties! At the time, however, I experienced a decline in my productivity. Migraine-free days were full of ideas and potential projects, but the artist in me would be paralyzed by the “migraine monster” during my headache days. Those same ideas would lose coherence and form. Lines and shadows were difficult to discern. Acute medications helped me fulfill my basic commitments as a mother, but even with them I found the “aftershock” of a migraine attack would give me the sensation of what I call “the artist with no hands”: that strange sensation of having the ideas inside your head but being unable to put them onto the paper. I came to see migraine as an agent that diluted my ideas, like boiling water that dissolves a drop of paint in a glass. 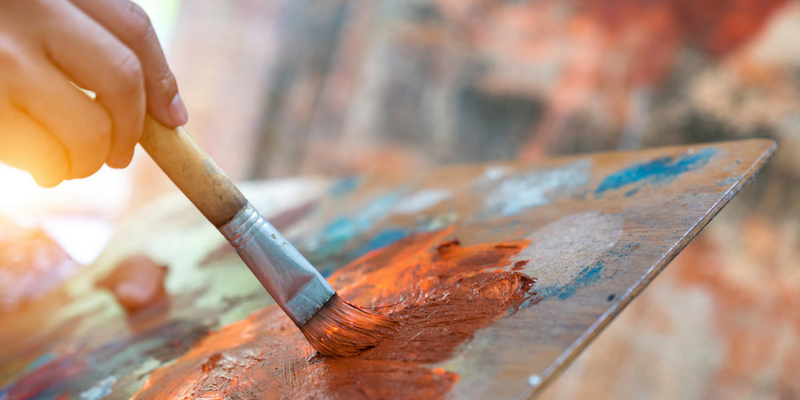 Another negative aspect of being a migraineur artist occurs when you find yourself unable to enjoy an exhibition, an art show or a fine art museum. Art is my life, and migraine was taking over that life. Migraine limited my visual scope as an artist. My eyes become disabled to light and color. By my early forties my chronic migraine had become severely disabling. I would find myself spending more days in my darkened bedroom than in my studio. I no longer experienced consistent relief with use of medication for acute headaches. My artistic productivity declined and was often reduced to a mere sketch in a notebook. Frustration. Disappointment. Migraine was consuming far too much of my life. 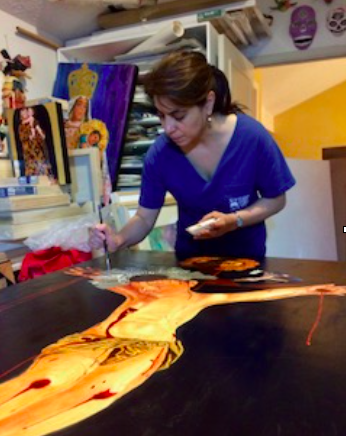 For questions regarding Ligia’s art or other examples of her work, Ms. Mendizabal may be contacted via email at ligmendi@yahoo.com.